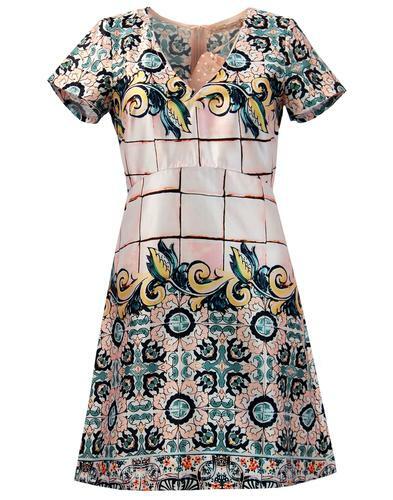 PEPE 'SCENE' RETRO SIXTIES FLORAL PSYCHEDELIC CHIFFON CAP SLEEVE MOD DRESS (Tin). 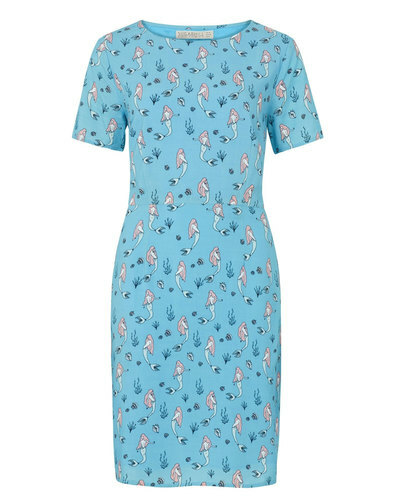 Introducing the fabulous Retro 'Scene' Dress from PEPE. Sixties Psychedelia poppy print fused with elegant flowing skirt that flares out from the waist. Stylish Mod chic pin tuck detailing and a striking, flowing, floral affair. The 'Scene' Dress by PEPE. A Psychedelic Sixties Floral Poppy design on an elegant sheer Chiffon dress. 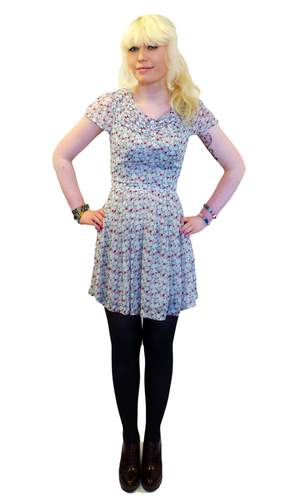 The 'Scene' Mod dress features cute cap sleeves, V-shape Retro pin tuck to neckline and back. Mini faux placket with Vintage chic covered button detail. Zip fasten to reverse. In a fabulous tin grey colour with contrast Retro poppy print in red and black, interweaved with a sweet ditsy microdot design. Flares out from the waist into a gathered floaty skirt for that striking Indie Mod look. 'Scene' Retro dress by PEPE. PEPE 'SCENE' RETRO SIXTIES FLORAL CHIFFON MOD DRESS. 'SCENE' SIXTIES MOD FLORAL CHIFFON CAP SLEEVE RETRO DRESS by PEPE - Tin grey Retro dress with red and black Sixties Psychedelic Floral poppy print. 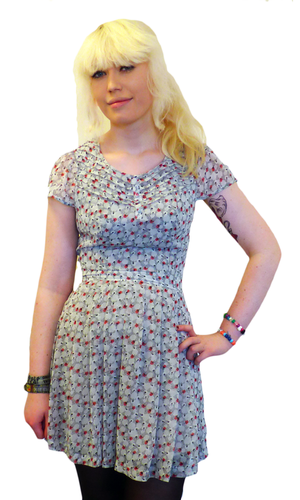 Retro, ditsy microdot pattern that weaves in and out of the poppy pattern. 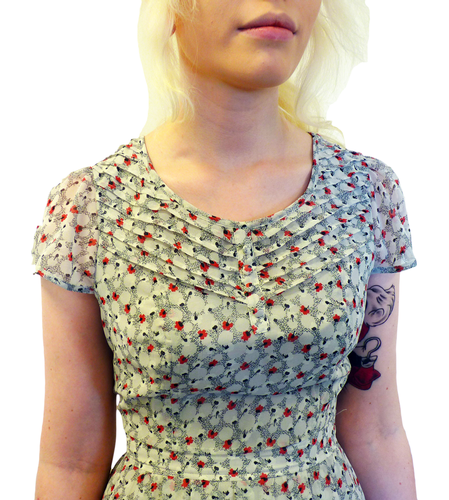 Zip to reverse, Vintage cap sleeves and a classic Mod pin tuck detail to the neckline. Flowing, gathered dress that flares out from the waistline. Faux placket detail with Mod covered buttons. 'Scene' Womens Retro Mod chiffon dress from Pepe. Composition: 100% Polyester exterior, Lining 100% Polyester. Care: Machine wash. Please refer to garment label for further care instructions. SKU: PL951035 'Scene' PEPE Chiffon Floral Dress. 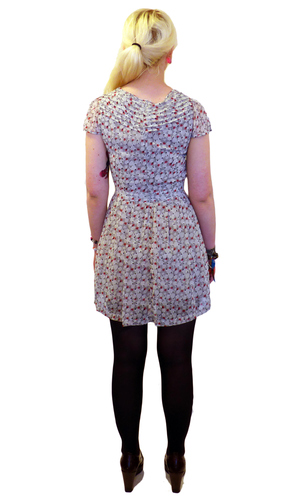 PEPE 'Scene' Retro Sixties Mod Chiffon Cap Sleeve Floral Poppy Print Dress.